Today I thought we could take a closer look at one of the blended malts from independent bottler Wemyss Malts. The lucky winner of this particular draw is the Spice King 12 YO. We are actually tasting this against the Spice King 8 YO, which my wife will post a review of in a few days. Up to ten different single malt whiskies are expertly blended together before introducing the “signature” malts to create three distinct taste profiles; 'Spicy', 'Peaty' and 'Honeyed'. 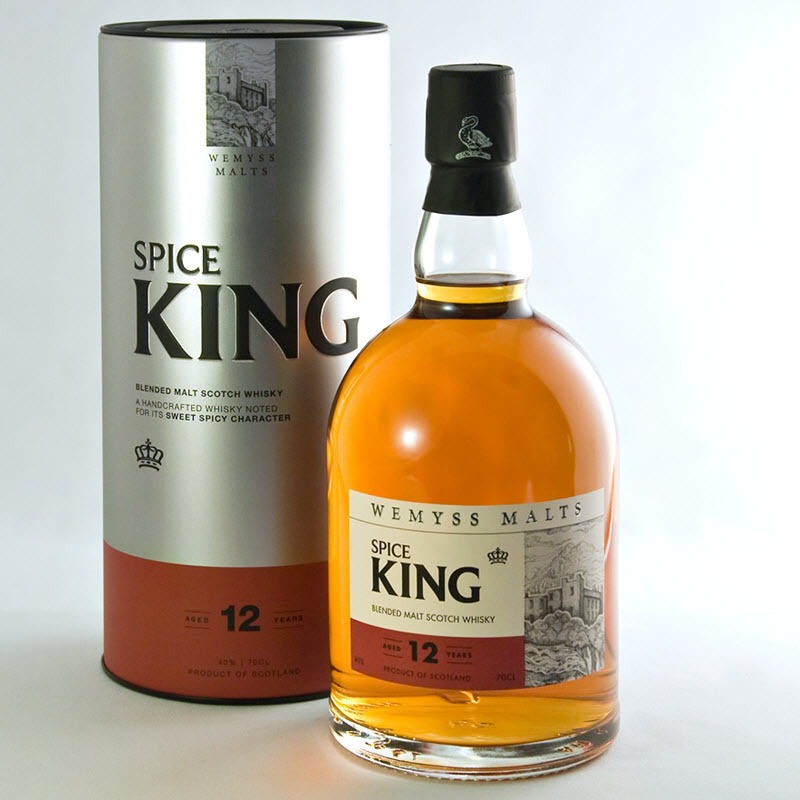 The Spice King 12 YO is available to buy in Norway at NOK (item number ), and in Sweden at SEK (item number ). Nose (21/25): Soft is the first that comes to mind, not spicy. Let's delve back in... OK, here we go - I found the spices. Soft cinnamon notes, a bit of salt, white pepper and nutmeg. Cracked, dry nutshells. It is rather soft and mild - more like a Spice Lord or Spice Baron, perhaps. Not big and powerful like a Spice King. Hold on, there's some exotic fruit here, notes of pineapple make a brief appearance. Finish (22/25): A pinch of salt is mixed with the chocolate - a chocolate that gets darker and more like pure cocoa. It dries up a bit and there's a nice cinnamon punch right at the end. It's like taking powdered cinnamon right on the tongue. The finish is medium long. There's a slight metallic note at the end, but nothing that really bothers me. Balance (21/25): Quite a nice, spicy dram. The nose was a bit too shy, maybe, but the spices were very much present on the palate. If you like cinnamon, then this one is definitely for you!